I would like to share my winning moments from yesterday's Great Taste White Coffee event. Few days ago, I received this cute invitation for the launch of Great Taste White: Choose Great, Win Great Promo. Indicated in the invitation is to bring empty sachets of Great Taste White Coffee. Why? I will tell you in a bit. At Crowne Plaza there were two stations where we can play and win more empty sachets. That 'shoot the ball in a mug' was kind a difficult for me, lol! I did not win but I'm glad to have five sachets at the photo booth after posing holding a cup of GT white coffee. Just before the event, our lovely host Ms. Gelli Victor kept saying to gather as many sachets as you can. The event proper started with a game. Two groups needed to smell, sip and guess the Great Taste White variants in each cups. 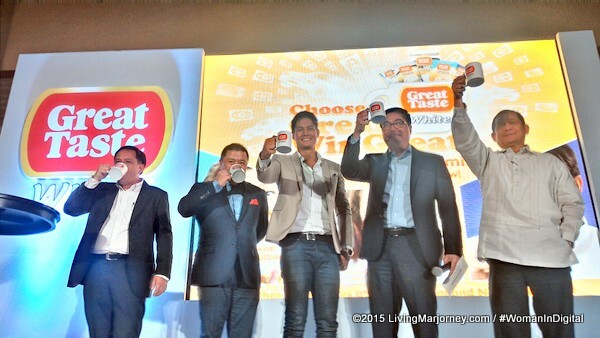 Next, Great Taste White’s Choose Great, Win Great Promo was revealed. 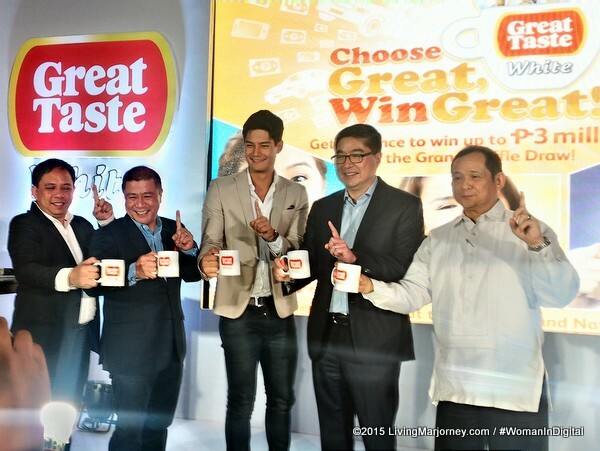 The coffee's brand ambassador Daniel Matsunaga also graced the event. We got to experience the raffle when they had the simulation. Our collected GT white empty sachets were placed in a box for the raffle. Everyone got excited for the fifteen (15) prizes to be given away. From P10,000 shopping spree at Robinsons, iPad Mini, iPhone 6, local trips courtesy of Cebu Pacific, round trip tickets to Bali, Indonesia and Australia for two. I wanted to win the shopping spree, hubby wanted an iPhone 6, lol but we did not win in the raffle. However, just before the simulation they distributed mugs with Great Taste White coffee for everybody to enjoy. I did not know that mug of coffee I'm holding would be my Great Taste winning entree. 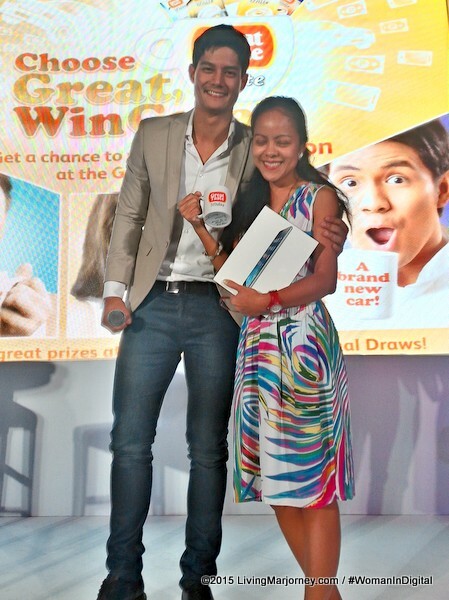 Two lucky guests received a mug with Daniel Matsunaga's signature underneath. Guess what, I'm one of them. The moment Gelli announced those who had the signed mug will receive an iPad Air, my heart jumped to joy. It was my grate-taste winning moment. Truly an advance birthday gift. 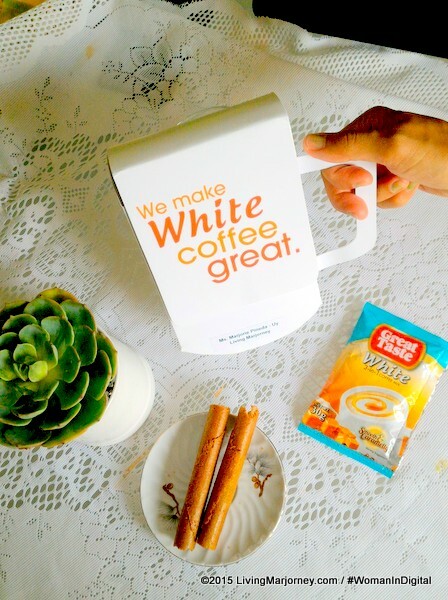 But here's the great news, you too can win amazing prizes by simply drinking Great Taste Coffee White. One (1) lucky winner will take home P3 million in cash and eight (8) others will get to own a white Toyota Vios 1.3 E M/T. To make his winning moment an even greater experience, the grand prize winner will get an exclusive sneak peek into the Pinoy Big Brother experience. Apart from the P3 million cash prize, he will also receive VIP tickets to the PBB: 737 Big Night, tour the PBB House, and get to meet and greet PBB: All In Big Winner Daniel Matsunaga. Great Taste White is making everyday wins even greater with the Choose Great, Win Great raffle, its biggest promo to date. More than P27 million worth of prizes are at stake. Open to all Filipino residents 18 years old and above. To join, simply collect five (5) empty sachets of any Great Taste White variant (Smooth & Creamy, Smooth & Creamy Sugarfree, Smooth & Caramelly, and Smooth & Chocolatey) or one (1) empty BigSAVE Pack. Place the empty packs in a plain white envelope with a piece of paper containing their complete name, birth date, current mailing address, mobile or landline number, store outlet where the product is purchased, and email address. One envelope qualifies for one entry, which can be dropped at drop boxes located in participating stores, supermarkets, and outlets nationwide. Promo period is from August 2 to September 18, 2015. There will be four (4) regional draws in five areas: Greater Manila Area, North Luzon, South Luzon, Visayas and Mindanao. For every regional draw, there will be one winner of P200,000 and one winner of P100,000 in each area. Two winners will also get their very own white MacBook Air, four winners will take home a white iPhone 6, and six winners will receive a white iPad Mini. There's no other hot drink I want every morning except for COFFEE. The aroma of coffee awaken my senses and gives me the extra energy I need in the morning. A cup of hot coffee goes well with hot pandesal. Every time I would sip a cup of Great Taste Coffee, it will remind me my winning moment. Start collecting those sachets now and join the Great Taste White: Choose Great, Win Great Promo. Good luck!